Pre heat the grill with the grill plates attached to maximum. Lay out the ciabatta slices on a tray. Mix together the olive oil, garlic puree, thyme leaves and seasoning. Drizzle over the ciabatta slices on both sides. Grill for 3-4 minutes and repeat until all slices are grilled. Set aside. 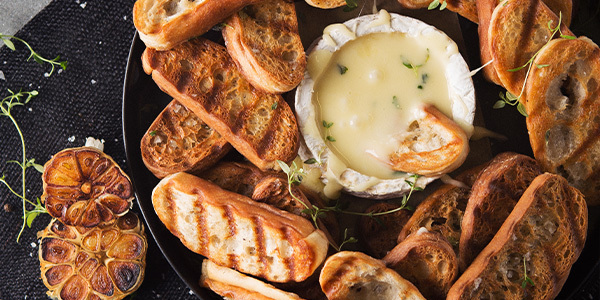 Place the camembert in the middle of the deep dish, heat the grill to medium temperature and close the lid for 4-5 minutes until the cheese is soft. Carefully cut the top of the camembert open and lay the ciabatta croutons around the cheese.